The 2019 Motorola Moto G7 is a middle-class smartphone whose biggest cons include its lack of support for Near Field Communication or NFC , which, at the time of this on-paper Phonerated review, was the go-to solution for cashless mobile transactions and data transfers. Moreover, it fails to impress us with its relatively low-key Qualcomm Snapdragon 632 eight-core 1.8GHz processor . 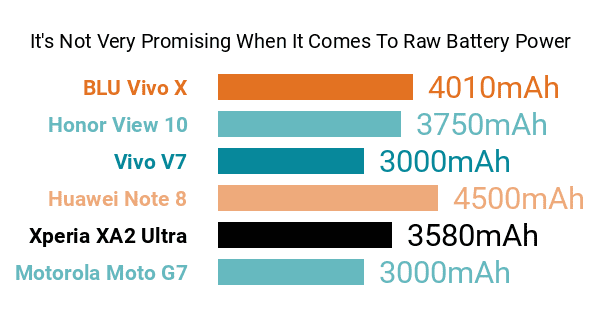 In comparison, some of the best octa-core phones on the market use chips that clock in at more or less 2.5GHz. Its accompanying 4GB RAM and Adreno 506 graphics processor sound just about right for a 2019 mid-range contender, though. As for its pros, the Moto G7 is rigged with a dual rear camera that's made up of a 12-megapixel f/1.8-aperture primary cam and a 5-megapixel depth sensor. It is capable of capturing 4K/UHD (3840 x 2160) videos at 30fps . Its camera specs also include hardware-level background blurring, the Cinemagraph option that lets users animate certain parts of still photos, and the Google Lens image-searching tool. Up front, the G7 touts a respectable (in this Android class) 8-megapixel camera accompanied by a screen flash function and Face Beauty. This 7th-generation Moto G model rocks a large 6.2-inch 19:9 LTPS display with a 2270 x 1080 Full HD+ resolution and a scratch-resistant Corning Gorilla Glass 3 finish -- check out some of the best phablets here. Its mix of pros and cons also includes a water-repellent exterior (with a p2i nano-coating) and a 3D glass backing. The G7 feeds off a passable 3000mAh battery infused with Motorola's signature 15W TurboPower charging technology, promising to replenish up to 9 hours of power in just a 15-minute charge . This 2019 Motorola release is loaded with no more than 64GB of native memory that's aided by its support for up to 128GB of extra storage, while its music features are headlined by the Dolby Atmos audio technology . Its security features include a fingerprint scanner and Moto Face Unlock. Summing up, given its aforementioned pros and cons, the Moto G7 sounds like a solid choice for middle-class smartphone shoppers whose priorities include photography and multimedia.